While set in WWII, Valiant is described by insiders as more Private Benjamin than Private Ryan, following a lonely and comically misfit pigeon through boot camp at the Royal Pigeon Service. Vastly unqualified for the job, Valiant squeaks his way through RAF training and is abruptly sent on the most important mission of the war, charged with carrying key dispatches from the French Resistance to Allies regarding the D-Day landing in Normandy. This is the motto of tiny Valiant (voice by Ewan Mcgregor), a young pigeon of big dreams. The statement is also the philosophy of filmmaker, Gray Chapman, in making this animated movie. 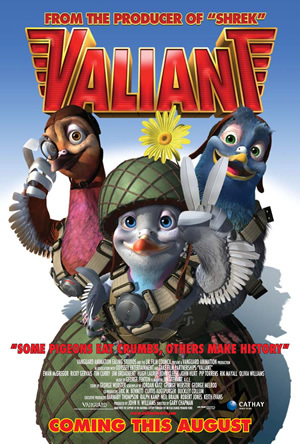 After helming many big budget animated projects liked “Shrek” and “Shrek II”, Chapman decided to take on VALIANT using half the usual budget necessary for any animation and also to complete its production in half the time require! Although his personal challenge is respectable, however, the constraint obviously does not help the animators in brainstorming for cuddly-looking characters. As a result, the pigeon’s soft toys (if there's any) are not going to be any hot seller in major toy stores. The sidekick French-speaking rats ironically, look more charming and hilarious than the pigeons. The “sabotage” rats, which appear for a mere few minutes, is enough to liven the crowd. It’s a pity that this movie is not about them. Unappealing characters? No problem. After all, the longtime favourite Shrek is not any Tom Cruise look alike. Where “Shrek” was touted with big names like “Austin Power” Mike Myers, “Charlie’s Angels” Cameron Diaz, and “Nutty Professor” Eddie Murphy, VALIANT have “Obi-wan” Ewan Mcgregor, as the voice of Valiant, to raise some attention of the movie. Ewan Mcgregor was last “heard” in ROBOTS hence it is no doubt effortless for him to contribute his voice for an animated character. The choice of other voice talents like Ricky Gervais and Tim Curry were perfect for the movie’s characters. Unfortunately, audiences are usually hungry for bigger casts. What’s left to attract audience to the movie is probably the imaginative presentation of the message-carrier pigeons amidst the chaos of World War II. II, but little may have expected that millions of animals had also given up their life to change the course of war. equivalent to the human honour, the Victoria Cross. During the period of World War II, the pigeons received the highest number of Dickin medals! Other Dickin medal’s recipients were Dogs, and even Cats. This refreshing interpretation of World War II may had earned some points from the critics. However, audiences nowadays are overly pampered with spendthrift budgets, detailed production designs and big casts name. VALIANT may have many disadvantages due to limited resources. Nevertheless, if you are not those “spoilt” moviegoers, VALIANT is still a worthy edu-tainment for you and your family.